We’re so very close to the release of Numenera! The books are literally being printed and put onto trucks as I type this. There’s still lots of logistical stuff to do even after they start arriving in the warehouse (not the least of which is that I have to do lots–and lots–of autographing), but we hope that packages will start shipping August 6th. The on-sale date (when it will be in stores) is August 14th, so there’s a really good chance that Kickstarter supporters and preorder customers will have theirs before that date. To be clear, we hope that this includes not just the corebook, but the Player’s Guide, the Nightmare Switch exclusive adventure, the dice, the cypher deck, the XP deck, the t-shirts, and the screens. All of that should be shipping starting on August 6th. Regardless of all that, the ebook versions of the corebook, the Player’s Guide, the decks, and the screen inserts should all be available to Kickstarter backers and preorder cutomers on August 1st. That means you should be looking for an email with download instructions on that day. If you don’t get one by the end of that day, contact Annie at [email protected]. The great people at 3lb Games are making an amazing app for Numenera. It will hopefully also be done in August. This app will be available in the iTunes app store and other places when it’s ready (look to 3lb Games for more info). For Kickstarter backers at the DABBLER level and above, we need your app platform choice. Kickstarter backers should check out the recent update for more information. Kickstarter backers at the SPECIALIZED COLLECTOR, CONTRIBUTOR, ALTRUISTIC COLLECTOR, ADVENTURE CONTRIBUTOR, COMPLETIST, BESTIARY CONTRIBUTOR, UNIQUE CHARACTER, GAMER, ONLINE GAMER, ART LOVER, ULTIMATE RETAILER, and BUDDING GAME DESIGNER levels should all be getting emails soon about how you want your books personalized. If you backed at one of these levels and don’t get an email by Wednesday the 24th of July, make sure you contact Tammie at [email protected]. In fact, if you have any questions at all about the Numenera release, backer rewards, or similar topics, please ask your question in an email to [email protected]. That’s where you are most likely to get the quickest and best response. August is going to be an exciting month! 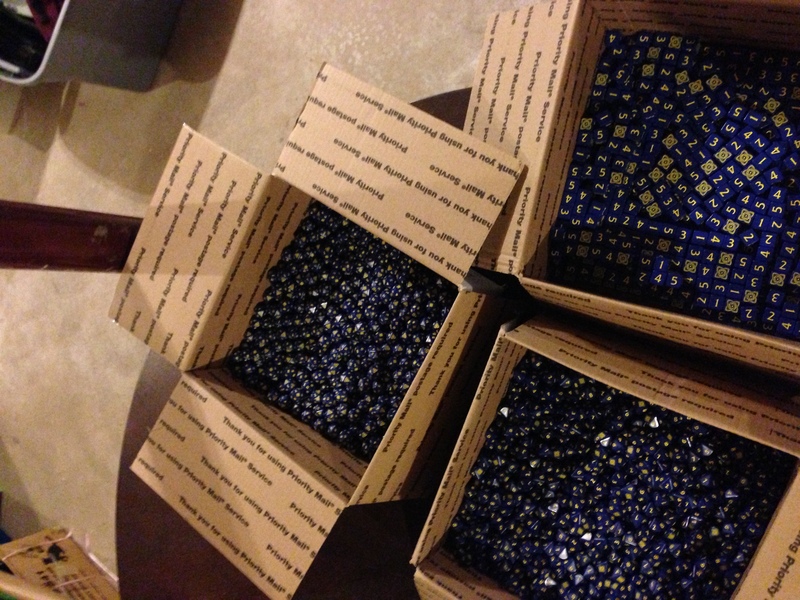 For now, I leave you with a fun sight: the dice arrived and are ready to be collated into sets!